Can this crafty plug-in exceed the sum of its parts? Inspiring, fun and with a fine sound, Sequent is a fine effort from Loomer. Several lovely-sounding effects. Superb parameter sequencing. Great MIDI mapping system. Handy pattern triggering via MIDI. Over 50 effective presets. No remote sequencer control. The routing UI needs some refinement. No individual sequence presets. It's easy to overlook Sequent at first glance. As the prominent vertical bars of the interface suggest, it offers step sequencing, while the array of knobs down the left govern further parameters. What's not immediately apparent, though, is that it's semi-modular. The two filter units, distortion, delay, looper, gate and pan modules can be wired up in pretty much any way you choose (although you can't create feedback loops) using a small routing panel at the top of the interface. Each effect sounds great on its own, but they're even better in combination. The values of various controls of each module are tied to individual step sequencers, tempo-synced to your DAW. Start with the Initial patch, for example, and drop one of the Filter modules into the signal path - you do this by connecting it to the input node and one of the two output nodes. The signal is stereo throughout, with the two output nodes used to create a mix according to the position of the crossfade knob, which is useful for wet/dry combinations, as well as parallel processing. With a module selected and enabled, the central step-sequencing area comes into play. The Filter modules, for instance, have two sets of bars: one for adjusting cutoff frequency and the other for resonance. You can also dial in fewer steps and alter the duration Sequent spends on each, as well as enabling random step selection and a random variation value. What you can and can't sequence depends on the module. The beat-shifting Looper is the most well-specified, featuring sequencers for nine of its parameters. However, the Delay module comes close, enabling to you adjust feedback and delay time, as well as the send amount. The Gate is also comprehensive, offering both slew and depth in addition to the on/off trigger value. The results can be fantastic, from the simple space dub sounds you get from a combination of filter and delay, through to digital granularity as small chunks of audio fly from the Looper into the analogue-style distortion. 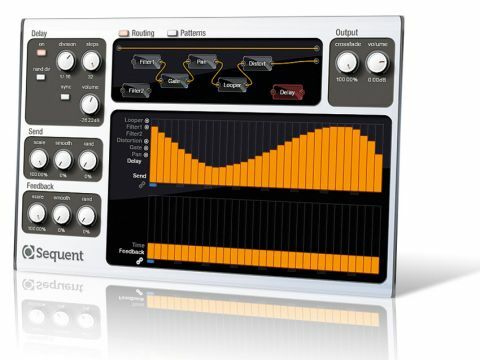 Sequent is capable of both subtle, rhythmic modulation and full-on electronic entropy. There's also a Pattern mode, for switching between up to 12 completely different setups via MIDI. The Looper effect is arguably what gives Sequent its character. It has nine sequencable parameters, the basic one being the row of Trigger toggles. Whenever the sequencer encounters an 'on' cell, the audio is sliced and repeated, with the other eight parameter sequencers determining exactly what happens during the repetition. Parameters include length, sample offset and pitch, and the number of times a slice can repeat within its own timed slot. You can also reverse a slice, set a pitch decay (the pitch will rise or fall with each repeat) and lock its repetition to the overall tempo. With subtle use, it's like a rhythmic delay, and gentle shifts in pitch also work well for pulsing pads and tonal delays. At extremes, it's instant IDM, spitting out frenetic drills and buzzes. Add the random variation/step selection and the Looper becomes an ever evolving beat machine from hell - or heaven, depending on your musical predilection. There are some problems, though. We don't like how you can't discern which modules are active from the routing window, and we'd like a more intuitive way of disconnecting cables. Currently, you click on the output and an input is removed, which works fine until you've got multiple destinations to contend with. It's also not possible to control individual steps of a sequence with MIDI, to set the values using faders or knobs on a controller. We'd also like to see presets for individual sequencers. Overall, though, Sequent is a winner, and any niggles can be excused for the first release of what is a great-sounding and easy-to-use bit of creative software.